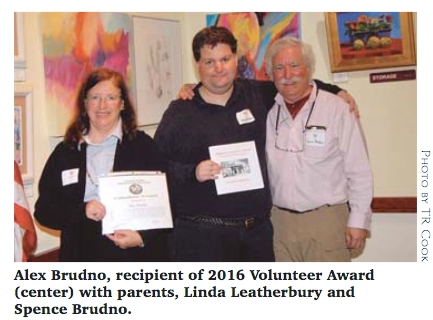 The Great Falls Historical Society has recognized Alex Brudno as the 2016 Volunteer of the Year. Through his consistent, focused and dedicated volunteer efforts, including working as a summer intern to further the Colvin Run Historic District research (more than 100 hours); photo archiving in support of our archive reorganization; running the Great Falls Historical Society’s Publication Sales presence at the farmers market and at GFHS programs independently, including adding new product offerings; serving as associate editor to prepare the book on Thelma’s Country Store, providing citations to establish historic facts, and supporting many other projects as needed, Alex has served with purpose to advance the integrity of local history. Alex Brudno first offered his services as volunteer to the Great Falls Historical Society in October 2014. A graduate of the University of Mary Washington with a major in history, GFHS welcomed Alex and immediately found projects for Alex. Alex’s first assignment was to take over the GFHS tent at the Great Falls Farmers Market. Alex continues to staff the tent, spending seven hours each and every Saturday at the market, providing a tangible location where newcomers can ask questions about the history of Great Falls, members can renew their membership, and the entire community can purchase gifts or make a reservation for one of our events. Alex was initially a “diamond-in-the-raw,” being high on willingness and dedication, but inexperienced at interacting with the public. However, over time and with constructive feedback and lots of interaction with farmers-market regulars and visitors, Alex has grown in sales discipline and humor. 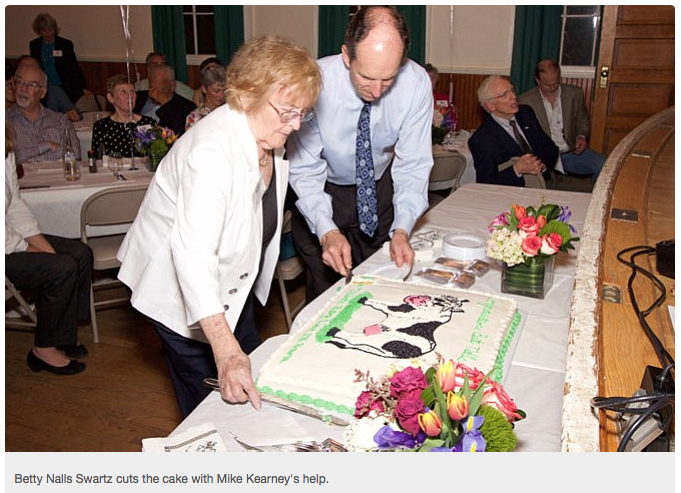 Former award winners, Great Falls Historical Society (GFHS) board and members and many friends of Betty Swartz gathered last Thursday to participate in celebrating Betty's many contributions. Greg Haymans, Chair of the Tibbetts Award Selection Committee conveyed the Award. Karen Washburn, member of the committee, provided the history of the award. The Great Falls Historical Society recognized Betty for her many years of work in the fields of education and historic preservation. 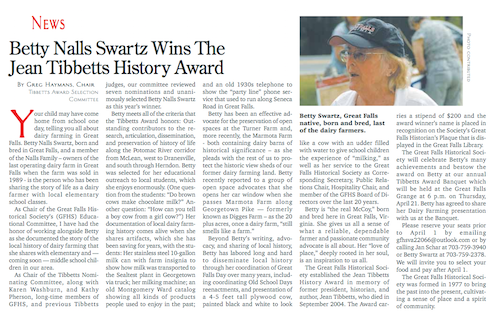 Betty's accomplishments include: An outstanding outreach program for local school children that conveys local dairy farming history through stories and artifacts; advocacy for the preservation of former dairy farm properties as open spaces; and the dissemination of local history through her coordination of Great Falls Days and Old School Days. For many years, Betty Nalls Swartz has educated and entertained countless people with demonstrations and stories of former times, preserving a valuation part of our local history that will surely live on in our collective village memory for generations to come. The Old Brogue catered the event with elegant recipes fitting of a banquet. The Stewart Sisters played country music. In addition to TR Cook, Mara Szabova photographed, while Badri Glonti videotaped the event. Effie Shaw baked the cake which featured the famous cow that Betty brought to many events to show children how to milk a cow. 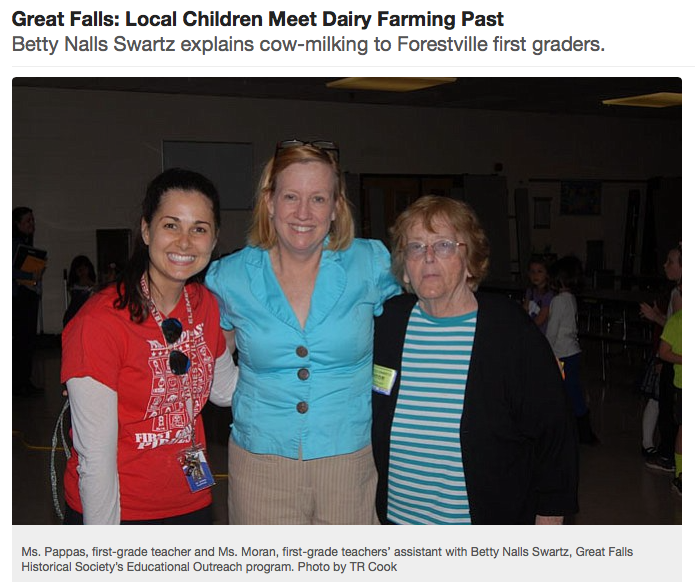 Betty Swartz and Greg Haymans visited the Forestville Elementary School’s kindergarten last Wednesday, and first grade last Thursday to share how Great Falls used to be the most productive dairy farming community in Fairfax County. Swartz and Haymans answered the enthusiastic questions all of the students had on the subject. Dairy is a food product that touches a child’s life almost daily. However, it was clear from the questioning that the children were unaware of what milk was, where it came from, how cows eat and digest, what was involved in getting milk from the cow into the carton, etc. Swartz helped them understand how our food is connected to the fields, the grass, fresh air, and healthy animals. The children showed their appreciation and amazement for Swartz’s way of life that is a rarity in the community. The Great Falls Historical Society is honoring Betty Nalls Swartz as the 2016 recipient of the Jean Tibbetts History Award on April 21 at the Great Falls Grange Hall. To participate and attend email gfhsva22066@outlook.com or call Jan Schar at 703-759-3940. The Great Falls Historical Society was formed in 1977 to bring the past into the present through education programs, research, oral histories, and more. #She gave very important tips: If your house was built before 1940, do not trust the date it may be listed because if the county had no idea of the date, they would just list the property as 1900. Structural features and research of family members provide better clues. When working with the Land Tax books, properties will be listed in alphabetical order, however the properties will not be in order within a letter – (For example, within A, Abbott and Abrams may be listed under A, however Abrams may come before Abbott – you need to examine the entire category.) Hellman warns that Oral Histories should only be considered as a starting point, as people’s memories are not factual -- rather they report impressions and memories that may not be accurate or precise. Hellman used to be the Historian at the Virginia Room prior to conducting many historical research studies at the Fairfax County Department of Planning and Zoning. Currently, she is the Historic Site Manager for the Carlyle House Historic Site in Alexandria. The Carlyle House is featured prominently in the new PBS mini-series “Mercy Street.” Hellman is a past Acting Director of the Woodlawn and Pope-Leighey House. A graduate of Duke University, she has a master of Art degree in Architectural History from the University of Virginia. The Great Falls Historical Society’s March Program, Living on the Land (Part 2): “Equestrian” Great Falls will take place on Wednesday, March 9 at the Great Falls Library at 7 p.m. The spacious pastoral setting, uniquely characteristic of Great Falls, provides a vital setting for a wide range of equestrian activities. Hear the stories of how local horse people experience the land. Hear how equestrian families, local barns and riding schools experience oneness with the land as they care for their animals and enjoy their sport. Presenters include Georgia Bay of Lift Me Up!, Sharon Molster of Black Hill Stables, Karen Washburn, equestrian homestead, Weslie Karber, Normandy Farm, and Pam Mc Dormen, Southdown and homestead. The Great Falls Historical Society was organized in 1977 to promote community spirit by bringing the past into the present. The March program uncovers residents’ many experiences of a pastoral setting of Great Falls at a time when the community wrestles with such land preservation issues as Brooks Farm and Marmota Farm, some of the last vestiges of an agrarian past. Dairy farming was the most prevalent economic activity in the Great Falls area from the 1880s, after the Civil War, through to 1989, when the very last functioning dairy farm was sold. From the 1980s to the present, there has been a lot of local activity around mega-mansions, cul-de-sacs, and mowed lawns. However, the mission of our local citizens association, formed in the late-1960s, has been “To preserve and protect the semi-rural character of Great Falls.” The Great Falls Historical Society’s January Program, Living on the Land: Semi-Rural Great Falls, featured five local residents who bring their land into abundant life in remarkable ways, establishing a deep and enduring connection with their land. 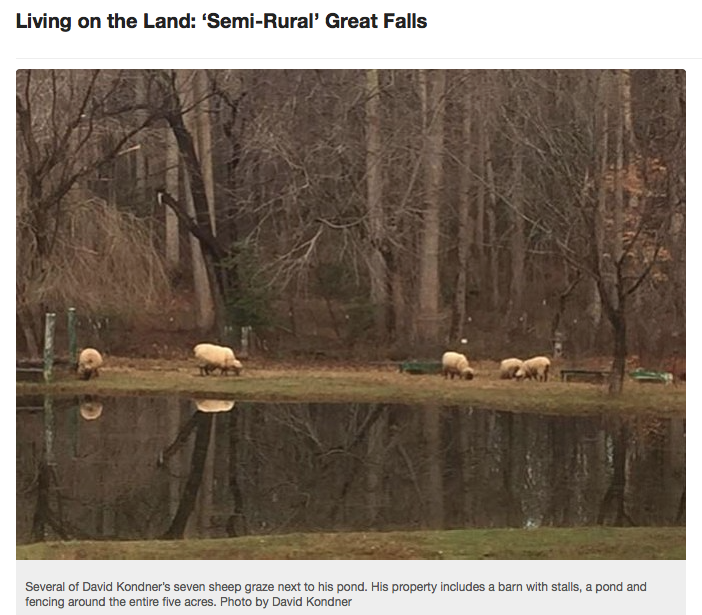 Dave Kondner grew up on a 350-acre cattle ranch in the Maryland countryside. Although there wasn’t much money in small farming, he always loved the natural environment. When he found his 5-acre property in Great Falls, so close to urban amenities but shielded from the urban hubbub, Kondner and his wife bought a five-acre former horse farm with a house and barn, completely fenced, with a pond and lots of untouched countryside. Kondner loves the great wildlife around his home including the bald eagle, the red-shouldered hawk, the osprey, even a wild turkey, and lots of wild birds that hang out on his feeder. Kondner’s property is a Certified Wildlife Habitat. Domestic geese and lots of wild geese enjoy his pond. Kondner built a koi pond with a fountain in his front yard. Kondner’s deck overlooks his pasture, making it possible for him to throw food scrapes over the deck for his herd to enjoy. Kondner has four goats and seven sheep and, ah yes, meat in the fall. Sheep are lean, but goats are even leaner. The pulse of life around him gives him great joy, delight and a sense of wellbeing. The goat herd of American and French Alpines are bred and kidded annually at the Amalthea Ridge Farm, a three-acre farm on Fringe Tree Road in Great Falls. Some are sold to other farmers and some are kept for milk production, and such artisan products as milk, cheese, lotions and soaps. Keyvan Moussavi and his wife Sarah Wehri manage a herd of up to 30 goats on their three wooded acres next to a 100-year flood plain off of Leigh Mill Road. Their endeavors involve the year-round lifecycle of mating, birthing, weaning, selling or keeping a solid genetic mix of well-fed, well-bred, well-behaved and well-socialized animals who produce outstanding milk for those with milk and cheese shares or for use in luxury soaps and lotions. Sarah, a who holds a Ph.D. and is a biochemist, wrote her thesis on emollience and fashions remarkable soaps right here in Great Falls. The Smith's Historic Raspberry Garden: This raspberry garden is filled with red, yellow, black and purple raspberries – both summer and everbearing – as well as a variety of herbs. Barbara and Doug Smith live in the historic John Gunnell House on Arnon Meadow Road, built in 1851. An old garden still stands. Barbara has endeavored to locate heirloom bulbs and seeds from the earliest known dates that would have been in keeping with the time the house was built. Barbara noted the heritage trees found on her property as well as a fenced-in raspberry garden from the previous owner. Barbara is experimenting with different kinds of raspberries, both summer and ever-bearing berries. New gardens have been built that include a fruit orchard and a deer-proof garden to grow organic vegetables, with a small garden nearby for asparagus. Barbara started a wildlife habitat for all kinds of birds, butterflies and other wildlife, and has enjoyed watching the bluebirds building their nests. In the process, she has become particularly concerned about the monarch butterflies and now raises butterflies from the baby caterpillars found on milkweed in her garden, setting them free once they emerge from the chrysalis 10 to 14 days later. Her greatest pleasure is the enthusiasm of their grandchildren – weeding, mulching, planting seeds, picking raspberries, filling the bird feeder, and most of all, seeking and gathering monarch caterpillars and watching with fascination each life stage of these beautiful creatures. Chris and Sara Guerre rent two acres of fertile farmland just off of River Bend Road, where they plant, grow, harvest and prepare organic-equivalent produce for Maple Avenue Market, their boutique food store on Maple Avenue in Vienna, their various farmers markets, and of particular importance, their commitment to getting their organic produce into the public school cafeteria. Getting better food in the cafeteria helps kids eat better, enjoy healthy food, and hopefully change their attitude about food. Feeding school children is clearly Chris’s passion. He has helped kids build a garden at their schools, he has brought them on tours to his farm, he and Sara have brought prepared vegetables and salads to schools to share healthy eating and new tastes. Chris’ eyes sparkled when he reflected on the miracle of a handful of seeds, which cost next to nothing, and the wonderful miracle of the planted seed, and the abundance it gives forth. His amazement with the miracle of earth, seed and water inspires his year-round dedication and commitment. Barbara and Doug Cobb own a 13-acre property on Crocked Crow just off of Georgetown Pike. In Doug’s oral history, he refers to his property as “paradise.” A mix of wild, wooded acres, manicured flower gardens, and vegetable gardens, the land conveys all the lush and wonderful aspects of nature. Barbara and Doug have decided to keep their garden in tact by enlisting their property with the Northern Virginia Conservation Trust. As such, it is permanently protected from being subdivided, and will remain as one single property for generations to come. As we have learned and have recorded for future generations, in the year 2016 there were residents living upon our land called Great Falls who were still fully in touch with the full and essential meaning of “semi-rural” and one might say, quite simply, they their simple connection with the land created for them lives of great joy. The presentations have been filmed and may be viewed at our web site (www.gfhs.org). The Great Falls Historical Society was organized in 1977 to promote community spirit by bringing the past into the present. Our next program, “Historic Preservation” presented by Susan Hellman will be on Wednesday, Feb. 10 at 7 p.m. at the Great Falls Library Meeting Room. 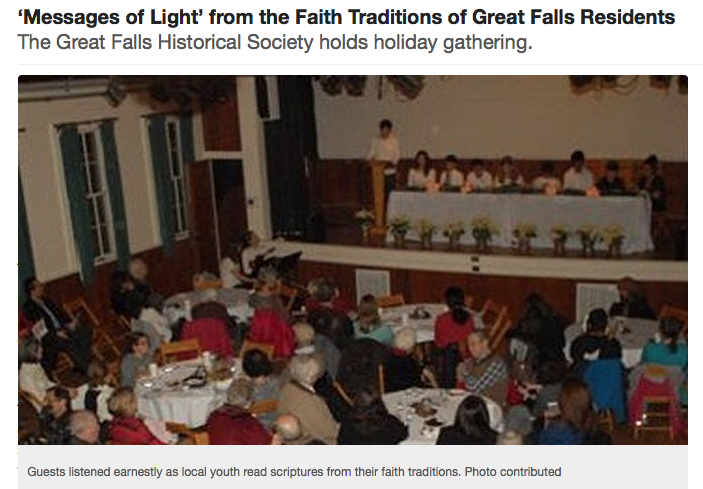 At our annual holiday celebrations over the last few years, we have noted the increasingly diverse community that Great Falls has become, as families from cultures around the world have journeyed by plane to Great Falls - as compared with travel by foot or horse-and-carriage more than 100 years ago – to live and work nearby. The planning committee included Charles Stevenson, Janet Hill Al-Hussaini, Marjaneh Adell, Eve Loudenback, and I. We met twice a week for six weeks to research and unfold the story of neighborliness in today’s context. We wanted the program to be local – representing the faith traditions of people who live in Great Falls today, inviting all local residents to take part in our holiday gathering. The program began with a half-hour presentation by nine youths that compared the sacred scriptures of eight religions with regard to nine messages of “neighborliness” – we referred to these as “messages of light:” The Golden Rule; speaking truth; being generous; loving; being a peace-maker; “as you sow, so shall you reap;” living by “more than bread alone;” not judging; and living in unity. Each of nine youths who practiced one of the religious traditions read their religion’s scriptures on the topic. To everyone’s amazement, each faith tradition has language on the core “messages of light” that were just about identical in guidance and direction – and often in wording. We were able to find the appropriate scriptures for each religion, thanks to the power of the Internet. It is now possible to search a topic and a religion and find relevant quotes fairly quickly. THE FAITH TRADITIONS and the youth who read were: Mateen Ghassemi, 17, Potomac School, senior, who introduced each theme; American Indian, read by Noora Haghighi, Langley High School junior; Baha’i, Jian Mostaghim, 12, Potomac School; Buddhist, James Tran, 12, son of Julie and Vu Tran of the Nail Salon in Great Falls; Christian, Delaney Ross, 10, Colvin Run Elementary (and granddaughter of Pauline Ross, one of the earliest members of the Society); Hindu, Arnav Ketineni, 8, Colvin Run Elementary; Muslim, Kareem Baig, 14, Cooper Middle School; Jewish, Issac Zaret, 10, Great Falls Elementary; and Zoroastrian, Aundia Mehr Rostami, 17, South Lakes High School senior. The overriding message: It seemed as if there is one Great Spirit (as the American Indian would say), who has been revealing the same messages to prophets in each individual culture around the world – speaking the same messages to prophets in the local language. It is only now that the Internet allows us to understand the meanings across languages, that we can see the connections and realize the unity of values and principles inherent in all faith traditions. From left -- musicians Stephanie Hanson, clarinet, and Kismet Al-Hussaini, violin. A reflective atmosphere was enjoyed thanks to the classical violin and clarinet played by Kismet al-Hussaini and Stephanie Hanson, respectively. Jon Paul of Megawatt provided the sound engineering -- which was extremely important for this event – and Archie Brown filmed the event, while T.R. Cook took photos. The film and text will be available on our website later this month. Everyone was invited to bring a traditional holiday dish to share. Thanks to all the wonderful cooks who took the time to bring something wonderful, the cuisine was delightful! A chapel is a church that bears a family name. Andrew Chapel, founded in 1854, was occupied by Yankees and damaged during the civil war. It was rebuilt in 1869 by its 51 members, which grew to 80 members by 1871 – including the Follin family, the Money family, and the Gunnell family, among others - and was later renovated in 1907. The church was served by a circuit of ministers and did not have a full-time minister until 1957. At 76 years old, Reverend Jesse Brown and his wife Abigail came to the Leesburg Pike area with their 44-year old son, Augustus and 2 other ministers and purchased a 317-acre farm that spanned both sides of the Leesburg Pike, now known as Colvin Run Road, for $12 per acre. Both Jesse and Augustus had preaching licenses. The first worship service in Brown’s Chapel took place in 1879. They worshipped in the Liberty Church prior to that. Brown’s Chapel was moved to the entrance of Reston on May 3, 1968 to save the chapel, after 90 years of fine religious use. The worshippers who would later establish this church on Georgetown Pike originally came from Germany in 1708, via Lancaster, Pa. in 1719, then Prince William County in 1904. The Church of the Brethren site was established in 1905. Prior to building the church, they prayed at home in fellowship, then met at the Liberty Meeting House, where they met one Sunday per month. They built their own church in one year on the site of the Battle of Dranesville, where union forces fought on Dec. 20, 1861 – at one of the opening skirmishes of the civil war. They conducted their first service on Oct. 27, 1912. Each year on Dec. 20 they conduct a peace service, recalling the men who lost their lives in the Civil War battle at that location. The first chapel of the Dranesville Methodist Church, a small log cabin, was built at Sugarland Run in 1786. In 1790, the chapel was relocated to land granted to James and Eliza Coleman. Referred to as the Liberty Meeting House, the chapel was deeded for public use, free for all denominations and for the education of youth. The first class was held in 1852. In 1861, 161 men were killed during the civil war and the church was used as a hospital. After the Civil War, Lettie Ford Ellis walked from Louisiana to Dranesville to her home near Seneca Road. In 1903, she dedicated a one-acre portion of the property given to her to build a church. Recently collapsed, there are plans to rebuild the church with the intention of sharing the new construction with the entire neighborhood, across all denominations. Jesse Smith came from Mainstone, England, via New York and was a carpenter by trade. Starting in 1985, Jesse Smith attended the Liberty Meeting Hall. In 1861, Abraham Lincoln was elected President and one month later the Civil War began. There was a skirmish that took over the Dranesville Church, took crops and chickens. After the war the Smith Chapel was built. Beanie Lambert’s great-grandmothers worshiped at the church. Annie Johnson built Arnon Chapel. They cut trees from the property, and built the chapel. The bark of the oak trees can still be seen in the basement of the building. It was opened as Forestville, but in 1893, the name was changed to Arnon. Carolyn’s grandmother had a Sunday School class. When Carolyn’s grandfather heard that the name was Arnon, he left the new church and returned to Salem. The Great Falls Historical Society’s Oktoberfest pot- luck featured the autumn har vest. table space. The menu included Virginia honey baked ham, a classic German pork and sausage dish, made every year by the Follins, German meatballs by Maggie Mc Neil — lots of local regional dishes — and this year our “local” dishes embraced a Tepsi Lahana (cabbage cassorole), an Iraqi dish prepared by Janet Al Hussaini, and a Tunisia tajine prepared by Zokia Rabana. As the original settlers to Great Falls came from different countries, bringing the cui- sine local to their place of birth, the march of new- comers continues, and our community and our Soci- ety are enriched by the new traditions being shared among us. The Great Falls Historical Society welomes all residents of our community to join in sharing their traditions, becoming part of our shared “local” community. Betty Swartz was the Hospitality Chair who orchestrated this wonderful event. She is not one to take the credit, however. She is continually impressed with how people arrive early and pitch in to help to deliver this event in such a gracious and lovely manner. Sue Kawmy served as co-chair and worked closely with Betty to learn the cus- toms and traditions so that they may be carried forth into the future. The Follin family has a multi-generational heritage here in Great Falls. Calvin and his wife Jennifer have a long tradition of bring- ing a centerpiece German meat dish to the Oktoberfest. This year, the Oktoberfest fell on their 25th wedding anniversary and Betty very graciously recognized the occa- sion with a lovely bouquet of flowers. Kathleen Murphy gives Homer Johns a Great Falls Historical Society’s t-shirt. having a visible house number so that emer- gency response teams can find you. Carolyn Miller prepared a display board showing the various fire department locations. The Split String Band played bluegrass and Americana music. The Great Falls Historical Society was organized in 1977 to promote community spirit by bringing the past into the present. To learn more about our Society, please visit www.gfhs.org. Our next event is “The Legacy of Faith: Great Falls Churches, 1850s to 1940s,” to be presented on Nov. 4 at the Great Falls Library Meeting Room at 7 p.m. Admission is free and everyone is invited to attend. 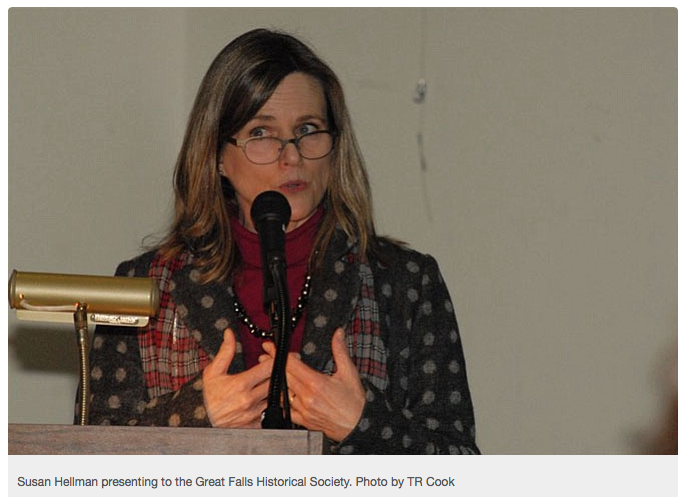 Debbie Robison’s presentation to the Great Falls Historical Society. There was a time in the mid- to late-1700s to mid-1800s when mills dotted the landscape along stream valleys throughout Fairfax County. Since there was no electric- ity, electric motors or mechanical engines, local residents harnessed the power of wa- ter flow to mobilize their mills. Their chal- lenge was to find a site along a stream val- ley with water flow powerful enough to operate a mill. The contours of the earth mattered. Most recently, the Fairfax County Environmental Protection Agency has chartered the county with cleaning up stream valleys and repairing riparian buffers, posing a danger to longstanding archeological ruins of old mills. Debbie Robison and her team of historians, archeologists and geographers have taken on the mission of locating his- torical mill ruins so as to designate them as historic resources and to secure their long- standing future protection. Robison reviews the literature in search of references to local mills. For example, thereisreferencetoa“JacksonMill”located on Leigh Mill Road. It is also referred to under other names at the same location – pointing to the series of owners’ names over the last few centuries. Deeds of title may refer to land features, providing clues to the latitude and longitude coordinates that identify a precise location. SOME THINGS TO KNOW: There are different kinds of mill wheels, some where water turns the wheel from the top of the wheel; some rotating the wheel through water contact at the bottom of the wheel. The pitch of the water can influence level of power. There is usually some overflow mechanism to deflect water from most mills, a protection in case the water begins to flood. Some mills have dams made entirely of stone, while others are a combination of stone and wood. It is important to note that when wood is kept completely under wa- ter, it never decays – remaining intact for centuries. So remnants of old mills found underwater are in the exact condition to- day as they were more than two centuries ago. Thus, it is very possible that as you take a walk along a stream valley park, you may come upon the ruins of historic mills, situated in the same place they were more than 200 years ago. It is interesting to note that milling was a major industry in the 1700-1800s. Local farmers grew grain and milled it for local consumption, or more likely, to export flour to Europe in exchange for European cur- rency. It is easy for us to imagine the late- 1800s through the 1980s when Great Falls was dotted with dairy farms, as many barns still stand today. It is more difficult to imag- ine finding mills peppering the land a cen- tury earlier. Robison is a preservation consultant who manages the historic preservation and res- toration program for an architectural and engineering firm located in Herndon. She serves on the Fairfax County History Com- mission and is a member of the Board of the Historic Centreville Society. She has written numerous articles about general aspects of Northern Virginia’s past and the history of specific sites. To promote preservation and facilitate local history education, Robison hosts a history website called Northern Virginia History Notes. You may explore her site at www.novahistory.org. THE GREAT FALLS HISTORICAL SO- CIETY was organized in 1977 to promote community spirit by bringing the past into the present. We do this through monthly programs on local history and people, pres- ervation efforts, publication of historical essays, collection of artifacts and photo- graphs, oral history interviews, genealogi- cal research, and tours and dinners at his- toric sites. We hope you will join in our ac- tivities and support these efforts through your membership. You are welcome to visit our website at www.gfhs.org. Join in on celebrating the harvest at the upcoming Oktoberfest Potluck Dinner at the historic Great Falls Grange on Wednesday, Oct. 14 at 6 p.m.